We design and manufacture robots primarily for injection moulding applications - be they for simple part removal or fully automated up and/or down stream systems - which is why Apex robots are so perfectly designed and built for their tasks. 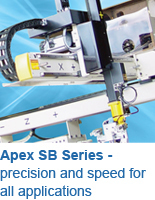 From the entry level radial action to high performance full servo units Apex will meet your needs. However, Apex systems are often installed in other production environments and we are always pleased to discuss specific requirements. 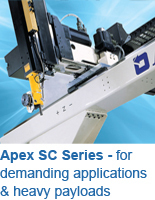 Each Apex robot model has complete functionality for the role it is designed to carry out – there are no ‘extra cost options’ for add-on-packs, higher-performance-versions, software modifications and so forth they do what our customers expect of them. Simplicity of set-up & operation Even the most sophisticated Apex robot can usually be installed, commissioned and programmed to start working productively, in under a day – often just a few hours. Commissioning of a production Cell may well take longer depending on the level of automation. Rapid return on investment Typically, Apex radial action robots100% return on investment is achieved in under six months and in usually 12 months for Apex beam robots. With an Apex robot it's efficiency savings all the way! Reduced scrap Apex robots greatly reduce the incidence of rejects thereby reducing scrap and leading to material cost savings. Improved quality Automated parts handling avoids damage during processing and aids consistency and repeatability. Faster cycle times By removing the margin of error from tasks which may have been performed manually, automated processes utilising Apex robots typically improve cycle times in some cases by up to 50%. Reduced energy consumption By cutting cycle times, Apex robots can make energy savings by reducing timescales for production runs and enabling moulding machines to run more efficiently. Better for your staff and your business Your workforce can be freed to carry out more profitable, less repetitive tasks.